The first challenge was finding a filling that would allow all that veggie goodness to actually stay inside the quesadilla without falling out every time you went in for a bite. In comes the sweet potato, spiced perfectly with a paprika chipotle blend that I absolutely adore from Victoria spices, it is the very same spice that I used in my lentil tacos. The sweet potato acts as the "glue" in your quesadilla. Because we like to get all crazy in our house, the second half of the quesadilla is slathered with the most amazing black bean spread - I had to stop myself from "testing" the black bean spread or else I wasn't going to have any left for my quesadilla. Corn, shallots and green peppers are quickly sauteed in chipotle olive oil // however standard olive oil is great too! I love tucking in a bit of greens any where I can, baby spinach lines the other half of the quesadilla for a burst of freshness. Once your quesadilla is assembled, it gets a quick pan fry / grill on both sides. It comes together as quick as you can steam the sweet potatoes - about 20-30 minutes from start to finish and you will have dinner on the table. This is the perfect recipe to use up any leftover mashed sweet potatoes you may have laying around. Peel and cube your sweet potato - steam sweet potato using a steamer basket on the stove or in the microwave. 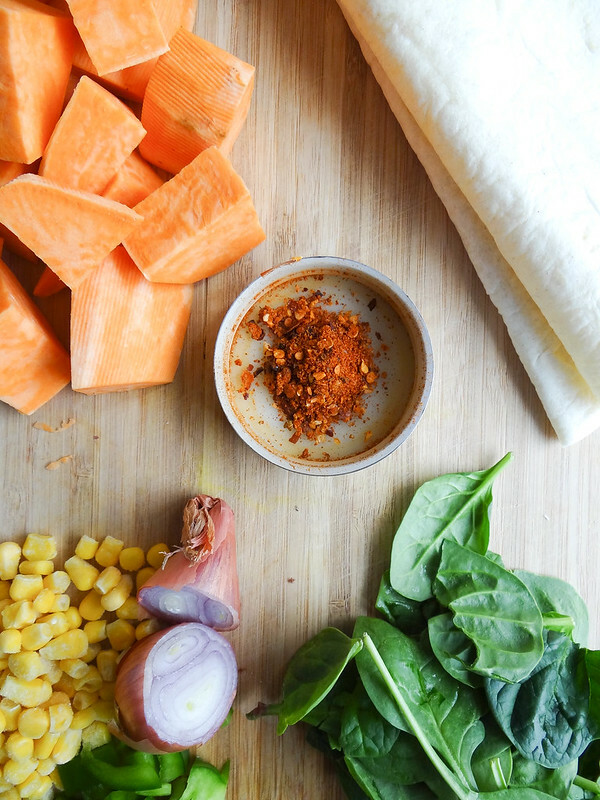 Once sweet potato is fork tender, place in a medium bowl and add chipotle seasoning + salt to taste. Using a rubber spatula or potato masher, mash sweet potato and set aside. While the sweet potato is steaming, heat a medium saute pan over medium/high heat- drizzle olive oil into pan. Add chopped pepper, corn and sliced shallots along with a little bit of salt, saute until peppers and shallots begin to soften, a little caramelize is good too. Remove from heat. In the bowl of your food processor (a mini processor is great if you have one) fitted with an s blade - add drained + rinsed black beans, juice of 1 lime, salt + Cholula. Process until black bean spread is smooth - about 1-2 minutes. 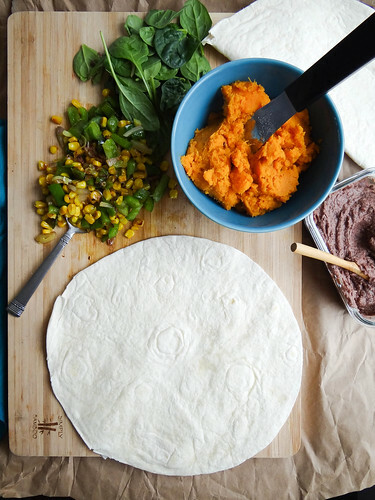 Lay your tortillas out on your work surface - spread half of each tortilla with the sweet potatoes and the other side of the tortilla with the black bean spread. Layer he veggie mix equally over the black bean side of the tortilla. 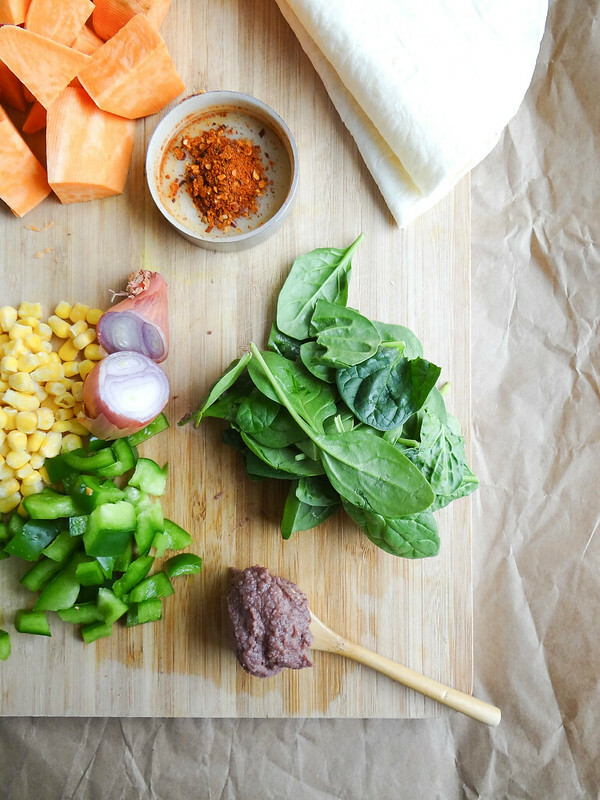 Layer baby spinach over the sweet potato. Bring the side of the tortilla together as if you are closing a book, repeat with the other tortilla. Using the same pan as you sauteed your veggies in or a griddle, heat a dab of vegan butter over medium heat. Place quesadilla in the pan and cook until golden brown, flip and cook the other side the same. About 2 minutes per side - repeat with other quesadilla. 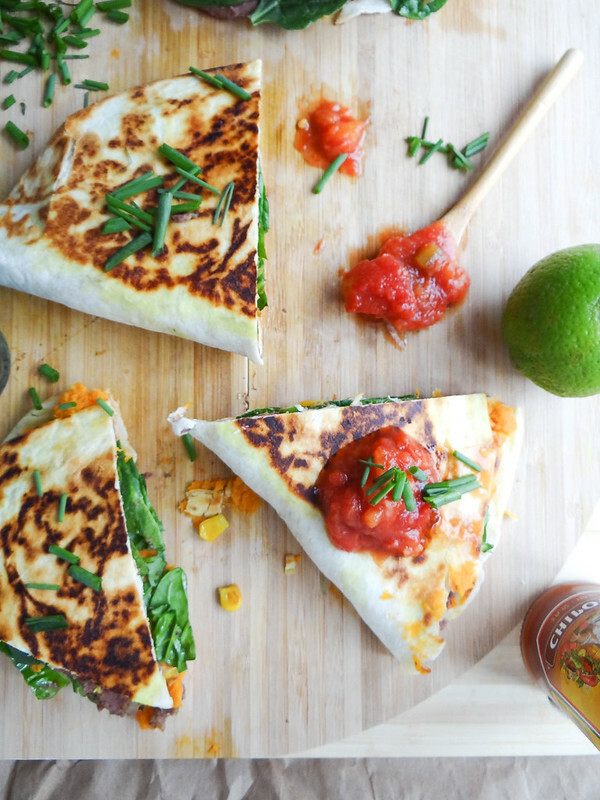 Remove from pan, cut quesadilla into 3 triangles and serve with your favorite salsa, guacamole, vegan sour cream or chives! Give me anything smoked paprika! 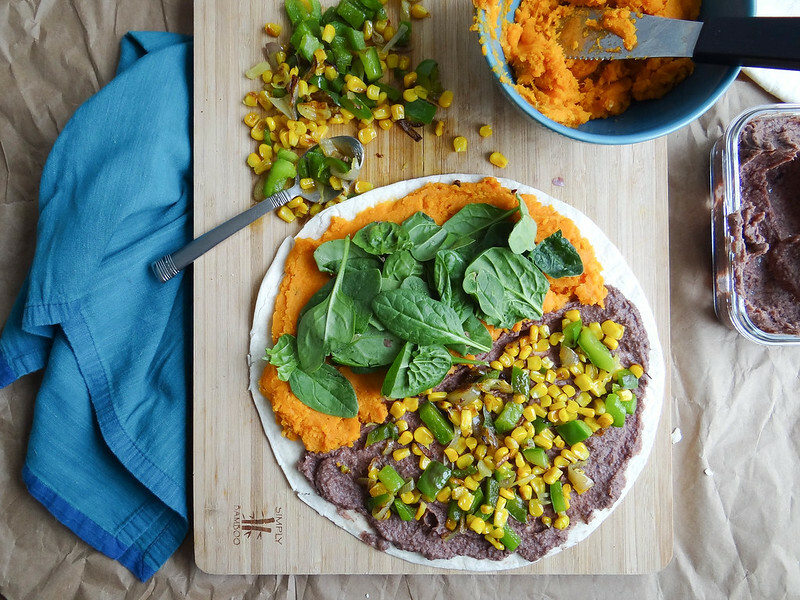 I like this idea of a cheeze-less quesadilla especially with the sweet potato for a little sweetness. Right, smoked paprika is amazing! 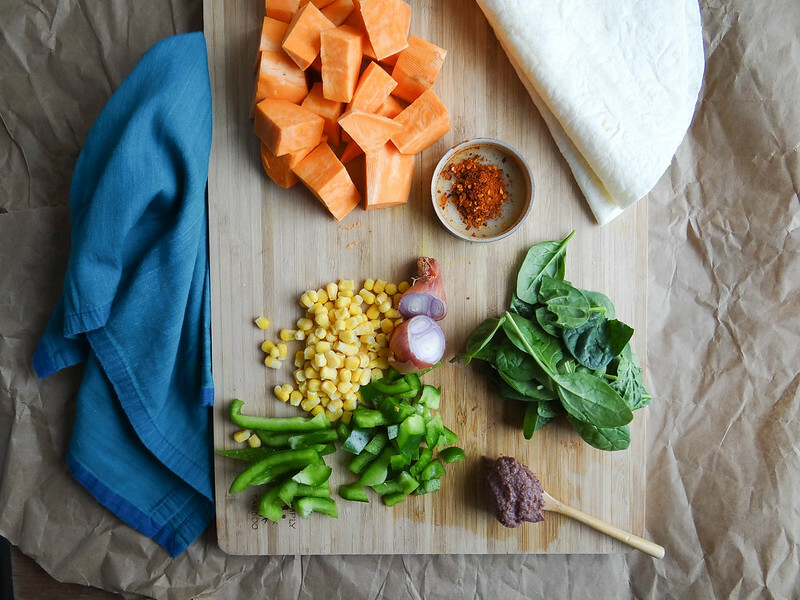 The sweet potato is one of my favorite veggies and is so good in a quesadilla! Mmm! I'm not a huge fan of cheese and these look like a delicious alternative! I'm sure I have all the ingredients in the cupboards too, so I'll definitely be making them. Awesome- they are so easy to make too! These sound delicious! Love how easy these are! 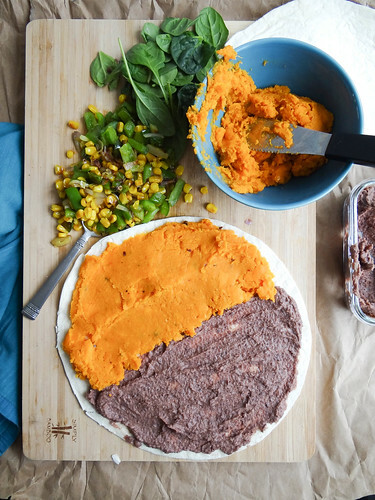 Sweet potato and black bean is such a great combination! I definitely need to get my hands on some corn too -- it's been far too long. These sound perfect for a quick, tasty lunch! I might have to try this as my wife is a big sweet potato fan. I love sweet potato and black bean together, and as I avoid dairy, quesadillas have been a sad, longed for treat. But these look awesome, and I can't wait to try them! 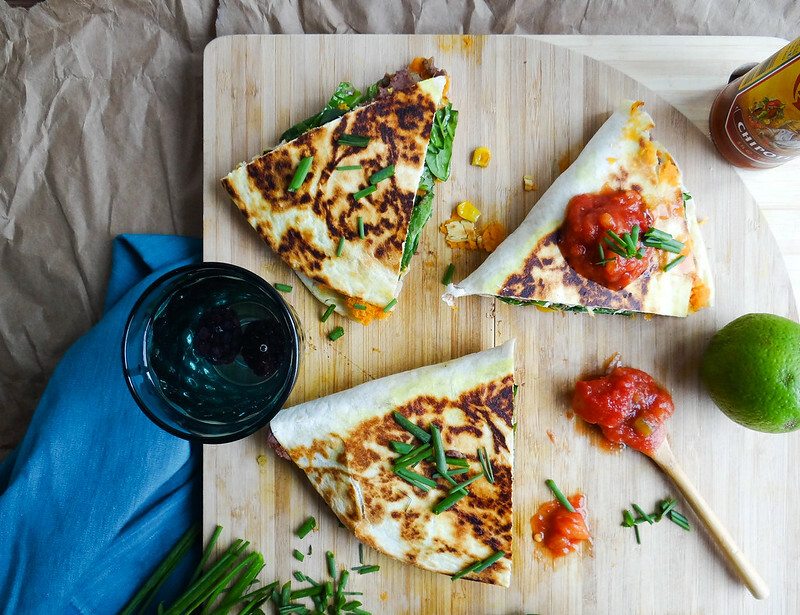 Quesadillas where the big thing that kept me from becoming a vegan, but this looks even better than the cheese kind! Wow, these look absolutely delicious!! 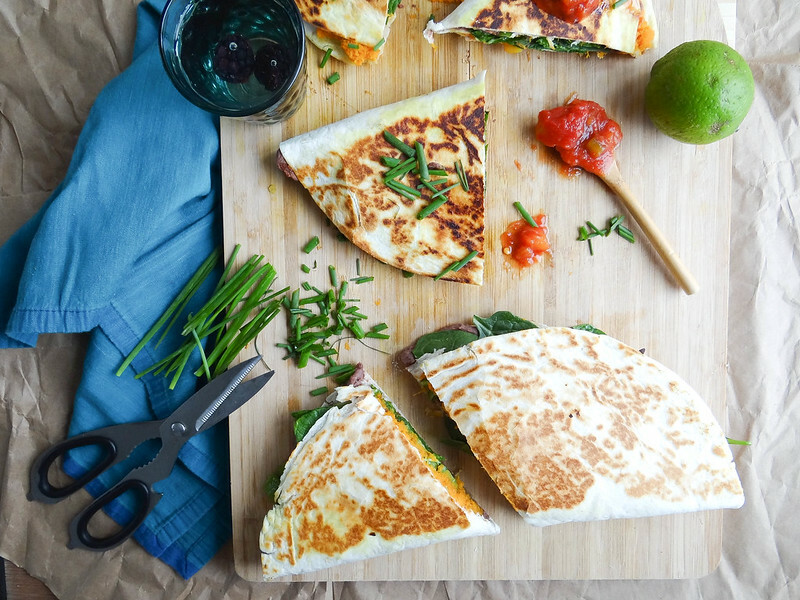 I love quesadillas so will definitely be making these! Great recipe! I think we need a new name for the queso-less quesadilla...patatadilla? frijoledilla?? Two of my favorite ingredients! These look so good and easy to make! This looks so amazing! I cannot wait to make these! What a nice day! 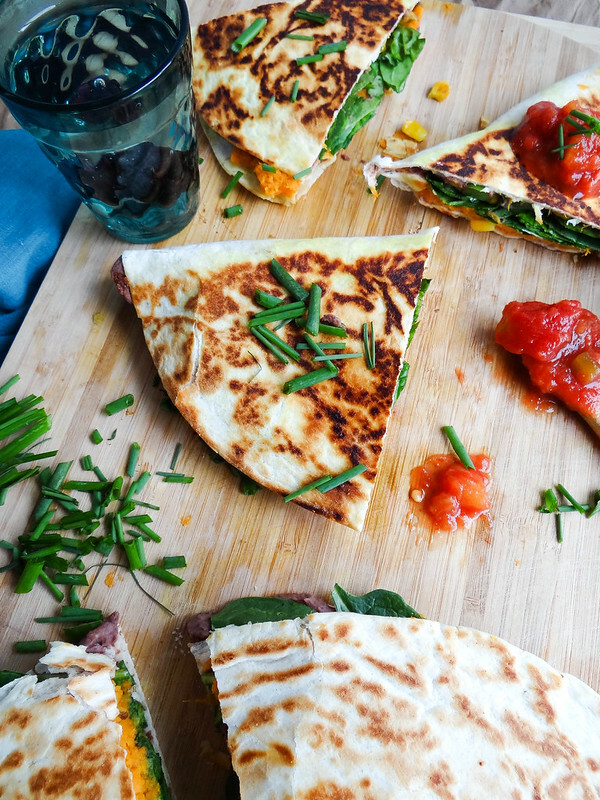 Your food blog is very cool and your sweet potato + black bean quesadillas recipe is so delicious! I love also your ingredients easy to make. It's look awesome and can't wait to try this. This would a perfect side dish especially this summer. I know my family is going to love it. Thanks friend for this sharing. Great recipe, I love it. Thank you for sharing this tutorial with us! Need some instant feedback on your essay? Check the free paper grader by PaperGraders.net . This is the AI-powered tool which grades your paper in no time and returns you some useful feedback as to how improve your paper. All these recipes either sounds tasty or look aamazing. These photographies is like an art and it lookf really nice. I recommend reading the purposes and functions of art because I see you have the inclination to that. Yammy! I like cooking, it's has been my hobby since childhood. But now I've got not enough time for it, I'm overloaded with homework assignments. Recently I've stumbled upon this website, they help me with writing a interview essay.